On the heels of break-out album Major Arcana, this EP tells the story of a band in constant, subtle evolution. Last year found Speedy Ortiz breaking out with Major Arcana. Their short return EP, Real Hair, could easily have been a victory lap. But it is anything but. Along with the Sports EP, which preceded Major Arcana, this EP tells the story of a band in constant subtle evolution. Opener "American Horror" has a blasting chorus, charging drums, slicing riffs, but its tempers its darkness with a power-pop sunburst of energy. It's a straightforward, catchy start, but it allows "Oxygal" to catch us off guard. The guitars tangle and tumble behind the rise and fall of Sadie Dupuis' vocals. It's knotty song full of holes until the expansive, smoldering chorus. The other two songs, "Everything's Bigger" and "Shine Theory" continue the EP's two chief concerns: mixing the angular with the anthemic, the dark with the light. 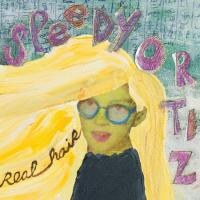 It's an impressive breadth of sounds for only 13 minutes of music and another impressive step forward for Speedy Ortiz. Major Arcana may have been the first full-band proper album from the group, but Real Hair proves it was no flash in the pan. Speedy Ortiz is just getting started and, despite its name, taking its time.